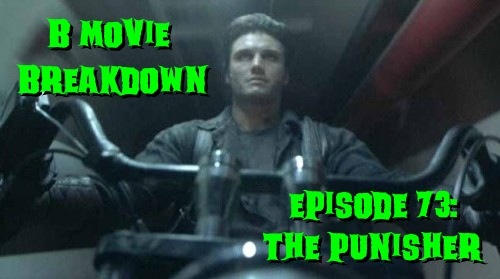 This week on the podcast we punish the guilty with the 1989 comic book movie, The Punisher starring Dolph Lundgren. While Dolph is mostly recognized for playing Ivan Drago in Rock IV and He-Man in Masters Of The Universe, it seems most people forget all about his role as The Punisher. A Marvel character that, to some, never got the best treatment on film and to others they really like the Thomas Jane one. While we here at B Movie Breakdown do enjoy all of the Punisher movies to date, this honestly has to be our favorite. It has that great 80s action feel and truly does the character justice for the most part. Yes, we know he doesn’t where the famous shirt and the acting isn’t the greatest, but it deserves more credit than people give it. It’s crazy violent, full of swearing, and is just enough ‘over the top’ to not be absurd. Yeah it has some cheesy dialogue, but thats the charm of an 80’s action movie, right? Anywho, after listening to Episode 73, you may want to check this one out for yourself. Instead of leaving you guys hanging again episode-less next week, we have decided to record an episode counting down our individual Top (or Bottom) 3 Worst Movies we have ever seen. Now, I’m sure some of you may disagree with the films each of us chose, but hell we disagreed with each other on some of them. We also want to know what you, the listener, thinks are 3 of the worst movies of all time! So go to our Contact page and hit us up!